The Salem Red Sox rallied for three runs in the bottom of the ninth, but Carolina had already scored three runs in the top of the ninth, ensuring the visitors would survive with a 7-5 victory on Mother’s Day at LewisGale Field. All weekend long, the Salem Red Sox are inviting their fans to help choose the team’s next bobblehead giveaway. Salem’s first ever “Fans’ Choice Bobblehead Night” will be held on Sunday, Aug. 24. The Salem Red Sox are excited to share their plans for Tuesday, May 20, which will mark the 75th anniversary of the first ever game played in Salem. On that evening, with the Winston-Salem Dash in town, the Red Sox will host “Turn Back the Clock” Night, featuring numerous special deals and promotions. 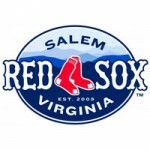 The Salem Red Sox won their 16th straight game on Tuesday night, matching the greatest winning streak in the history of the Carolina League, by narrowly holding on to defeat the Winston-Salem Dash 12-11 in the home opener at LewisGale Field.